I’ve known Heather Wolpert-Gawron a long time, since we were both in high school in Los Angeles. We lost touch for much of our college years and early adulthood, and when we reconnected, it was a neat coincidence to discover we had both become English teachers, with similar interests within the field as well. She has distinguished herself as a teacher, blogger, book author, and presenter, and it was my great pleasure to observe her teaching and include her in my book about teachers and schools throughout California. All of which is included as a sort of disclaimer, to let you know that I was certainly predisposed to like Wolpert-Gawron’s new book, Just Ask Us: Kids Speak Out on Student Engagement. She started with a simple idea, a strategy many teachers employ on a regular basis: ask students what’s working for them and what they’d like to change in their studies. What takes this book to the next level is that Wolpert-Gawron asked hundreds of students all over the United States, organized their responses into common themes, and then collected a variety of tools and strategies for teachers looking to expand their repertoire. The end result is a book is concise in style but rich in examples and resources for secondary school teachers. Each suggestion and bit of advice has the support of various studies and data, and the voices of the real experts – the students – can be found on almost every page as well. Wouldn’t it be interesting to make the student voice a de rigueur element of professional resources and publications in education? (With that idea in mind, I’ve decided to quote only students in this book review!) If you assume that students would only offer opinions like Don’t give us any homework, make classes easy, or show more movies, think again. Sure, those ideas are going to come up sometimes, but we need to be wise enough to see beneath the surface: as Wolpert-Gawron notes in the book’s introduction, the real issue is boredom. Students are similar to adults in that regard. No one wants to be bored. What happens when you go to a meeting to hear someone talk at you about information you either don’t understand or don’t think you need, and you have no choice about any aspect of what’s happening now or what happens next? “I always wanted to do things with partners and/or different people in the classroom. I am more interested in the lesson if we get to choose what we want to do” observes a student named Valeria (116). Likewise, a student named Antonio doesn’t want school to be easy, but rather, lively: “I love creativity and learning[;] we can make a way to make school a hybrid of both!” (166). And as I noted in my most recent blog post, extraordinary student effort, character, thoughtfulness, innovation, and achievements are paradoxically ordinary occurrences in schools – so don’t underestimate teens. So, if you think about all of the conditions that make you successful in work and effective as an adult learner, you’ll be well on the way to understanding what students want as well. Most of the topics forming the focus of the book won’t be surprising. Students want to engage, participate, create, talk, and collaborate; they want a variety of options and experiences, and they want their education to be relevant. 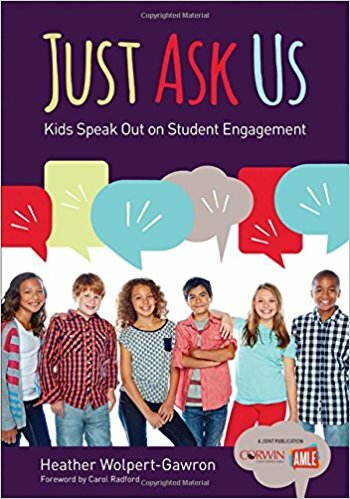 Even if you’re encountering familiar concepts in these chapters, however, the strength of Just Ask Us is that it offers enough volume and variety of specific ideas that you’re sure to find something useful, regardless of your teaching experience. Reading through the book, I found myself frequently thinking, “I could add this idea to what I do,” or, “I could change the way I do that to make it more engaging.” There are quick, practical suggestions, like a variety of ways to let students get up and move as part of a lesson, as a way of demonstrating knowledge or indicating an opinion (102-3). There are broader concepts always worth revisiting, such as the value of self-reflection in helping students take ownership of their learning and improve their habits and skills (82). Not all of the suggestions and examples come from Wolpert-Gawron directly. Each chapter also features a more detailed summary lessons and instructional design provided by other teachers. You might also want to keep your smartphone handy to scan QR codes throughout the book and then watch short video clips on topics of particular interest to you. The videos take concepts from the book and demonstrate their use in classrooms. There are also some portions of interviews with teachers, students, and Wolpert-Gawron. 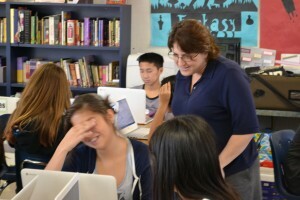 Heather Wolpert-Gawron working with students at Jefferson Middle School, San Gabriel, CA. There’s one chapter I want to highlight, as it speaks to the heart more than the mind. We know that teaching and learning are intertwined with emotion, and I was pleased to see that one of the themes emerging from Wolpert-Gawron’s survey of students was that they want teachers to “Show Us You’re Human Too” (Chapter 6). Tommy, a seventh-grader, notes that “My math class always engages me because my teacher shares the mistakes he makes throughout his life” (144). That quote earned a raised eyebrow from me, as I quickly brainstormed the number of ways that idea could go terribly wrong, stories of failed romances or drinking to excess. I’m confident that Tommy’s teacher actually shared some more appropriate examples of failure that would humanize him and make him – and hopefully mathematics – more relatable for students. Don’t worry. The kids know what’s up: a student named Caleb advises that it’s not helpful when teachers “don’t have the ability to tell a story about themselves that relates to the topic […. That] can make me more distracted to the lesson… but in my opinion, teachers that act like actual humans, interact with the students and share their ups and downs with each other, is the greatest way to engage a student in a lesson” (143). (Note: the editors of Just Ask Us chose to reproduce student survey responses without correcting spelling or grammar mistakes, and so with the exception of minor sentence structure adjustments in brackets, I have reproduced quotes as they appear in the book). This chapter is a bit unlike the others in the book in that you can’t download a personality or backwards plan a sense of humor. And Wolpert-Gawron makes it clear that each of us must be true to ourselves, not try to force a style or relationship that’s inauthentic. As the students and most teachers know, you can overdo it; bonding with students is a laudable goal, but centering yourself as the teacher, or trying to manage a class on the strength of your rapport with students, is poor pedagogy. Some teachers who have been hesitant to share anything personal may have received some bad advice, or might be overly concerned that straying from the lesson, even momentarily, will detract from their students’ learning. Wolpert-Gawron’s chapter on this topic makes it clear that students value these “human” interactions, and she offers a variety of academic sources that will support teachers infusing their teaching with humor and personal connections with students. (See pp. 134-40). It’s not all about personality, though. Teachers show they’re “human” by modeling a love of their subject matter and the learning process. Skimming the student quotes in the chapter, I repeatedly saw the words enthusiastic, energetic, lively, passionate. So if you’re not inclined to follow the example of Tommy’s math teacher sharing his personal failures, at least you can make sure students know how much you enjoy math, and teaching. For teachers of almost any subject, any secondary grade level, and any level of teaching experience, I think Just Ask Us provides useful reflections on our practices and resources to help us improve. And in a refreshing change from many education books, Heather Wolpert-Gawron consistently shares the voices and insights of the students for whom we do all this work in the first place.